Another month, another mix. The Dylan Samson Mix Series is back with some great tunes to fill your summer. This month's mix features music from artists like CHVRCHES, Tom Waits, and Asobi Seksu, plus new songs from the likes of A$AP Rocky and Thundercat. Those interested in snagging the physical copy can find it in Manhattan's East Village. While I wish this song had been included on CHVRCHES' fantastic debut album (it might be my favorite song they've recorded thus far), I can see what it got demoted to bonus track status. It wouldn't have fit in "The Bones of What You Believe"'s track list, there's no room for it in the album's ebb and flow. Beyond that, it could easily have stolen focus from the many other standout tracks on that record. It has everything we love about CHVRCHES: a catchy tune that could exist in any genre, a fantastic vocal performance from Lauren Mayberry, a melody that somehow hits higher, more intense musical peaks than most other bands around today. It's an attention grabber to say the least, one that most bands would have tacked on to their album simply because it existed. If you ask me though, it's exactly this kind of move that shows how much CHVRCHES cares about their art. Not only do they consistently make great music, but they're willing to sacrifice a song, to kill their own creation, if it might detract from their larger artistic statement. I had to include a Frank Ocean song on this month's mix. It's my own little way of encouraging him to make sure whatever it is he's planning on releasing this month actually makes it out before before August 1st. As of now, every rumor I've heard still suggests we'll get something new this month, but as I say with every album I've been anticipating with bated breath, I'll believe it when I see it. Who knows, maybe we'll have a new Frank Ocean album between now and when I leave this mix. In the mean time though, we can just listen to "Channel ORANGE" — including this masterpiece of a song — on repeat. Don't worry, it hasn't gotten old yet, it won't get old before the next album comes out. You've probably guessed by now, I really like Rustie. The man knows how to put a song together, something that just makes you nod your head and smile. That might not seem like much to ask from an electronic musician, but it's Rustie's clear knowledge of song-craft and seamless blending of electronic styles — both in perfect form on this album cut — that always keeps me coming back. He always seems to add and subtract elements from his songs at exactly the right moment, propelling things forward and keeping the music interesting, but never losing track of the core idea that made the song work in the first place. It's pretty clear that Thundercat aka Stephen Bruner secured his title as greatest contemporary bassist with this track. He somehow managed to make a song that starts with the line "Nobody move, there's blood on the floor" into the sexiest song that's been released this summer, all with that amazing bass line. The mic has been dropped. Top that, everyone else. I think it's safe to say that Sleigh Bells' second and third albums definitely did not live up to their first. Hell, the second half of their first album didn't really measure up to the first half. It's alright though, because when they have a song that works, it really works. The contrast between Derek E. Miller's jagged guitars and Alexis Krauss' ultra melodic vocal lines. Those electronic drum sounds that hit exactly on the beat. It all creates this intensity that just grabs you by the shoulders, shakes you hard, and demands you turn the volume up to eleven. I'm realizing now that I've yet to include any Run the Jewels' songs on my previous mixes. It's shameful, I know, particularly considering that Killer Mike and El-P are two of my favorite rappers of all time. Their individual output and influence is more than enough to put them in a pantheon occupied by the likes of Aesop Rock, GZA and Kendrick Lamar if you ask me. I was ecstatic when they released the first Run the Jewels record. Coming a year after they had each released some of the best albums of their careers (2012's "Cancer 4 Cure" and "R.A.P. Music,"), it felt simultaneously like a victory lap and a one off, something fun for two friends to do together to celebrate the huge professional and artistic step they'd each taken. But since then Run the Jewels has become something much different, something truly special. It's one of those rare occurrences where a collaboration becomes greater than the sum of its individual parts. Something where the artists involved are not only on the top of their individual games, but actually get each other to reach previously unattainable heights. I'm excited to see the first post-Run the Jewels solo albums from Mike and El, to hear how their influence on one another effects their individual work. Until then though, we've got Run the Jewels 3 in the pipeline, an unprecedented remix album made completely of cat sounds, and two amazing records to listen to in the mean time. Not to mention their individual catalogues, and their new weekly radio show. Life can be pretty great sometimes, right? This song is so quintessentially Tom Waits, at times it might almost seem like a joke. Those sounds, that voice, at first it seems just like another Waits song. But then you hear those drums. The way they almost immediately start to rush, but then suddenly slow down and drag behind the beat, only to start the cycle all over again. It leaves the listener completely off balance — it feels like the sound of bellows stoking a huge fire of an unknown, ungodly purpose — which just opens you up to receive Waits' completely unique approach to music. Just listen to those lyrics, how they're simultaneously biblically grandiose and deeply personal, yet still leave room for you to project your own meaning onto a lot of them. It's a balancing act, fitting since it often seems like Waits would be most at home as the leader of some warped traveling circus. He's a man of many tricks, many of which I'm sure we've never seen, and even more we never will. But those we do see, the ones that his jaw-dropping catalogue have revealed to us have been employed so skillfully and with such unique style that they'll likely never be replicated anywhere else. Step right up! Step right up! See the last completely unique musician! He won't be around forever. 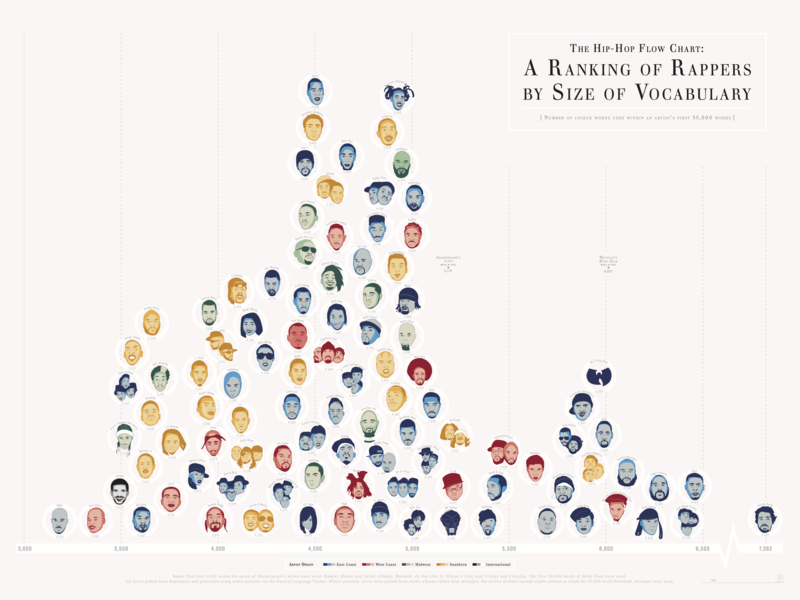 It was pretty cool last year when that list of rappers with the largest vocabularies came out. It was no surprise either to find Aesop Rock at the top of that list; he's been making some of the most verbally dexterous hip-hop for almost 20 years now. True, it takes more than a big vocabulary to make a great rapper, but going back through his catalogue (as I've been known to do on a surprisingly regular basis) it seems like Aesop has been one of the best rappers around since the day he stepped onto the scene. Just listen to the rapid fire lyrics of "Commencement at the Obedience Academy." Unless you've got the lyrics right in front of you, you're going to need to listen a few times just to figure out what he's saying. Once you've got the words, you have to decode them, not just to find out what he means with each line, but to figure out what his word choice says about that meaning, and how the song fits into the larger theme of the album it's on. It's going to take a while before you start to appreciate the science fiction and horror fantasy paranoia mixed with lyrics about farming (or are they about family? ), religion, systems, institutions, and American history that pop up on "Commencement at the Obedience Academy," and this is before you even get to all the personal references Aesop's been know to throw into his songs that keep them shrouded in a level of mystery to all but his closest friends. It's a lot of work for the listener, something that requires real effort on their part. So just imagine how much work it is for the artist, how much time and energy he puts into constructing these little puzzle boxes. Musicians simply don't do this kind of work, especially in this economic climate. But it's exactly that attention to detail, that clear respect for craft and style that makes Aesop's music so compelling, so urgent, that to turn away from it is almost a disservice to yourself as a fan of music. Don't balk at the challenge of an Aesop Rock record. Put the time in and you'll be rewarded 100 times over. Now this was legitimately surprising. Like I said when writing the blog post for Volume 53, I was fully expecting the next A$AP Rocky to be another boast filled album of summer jams. But I was excited for those boasts, what he delivered a far more flawed, and, as a result, far more interesting album. What we got with "AT.LONG.LAST.A$AP" was a much clearer portrait of Rocky as a human being, as someone dealing with the daily struggles of simple existence. Internal arguments, conflict with no clear resolution, I didn't think Rocky was capable of this kind of music, this kind of deeply personal, emotionally mature hip-hop. He's not mastered this change yet, and still has a lot of work to do if he wants to, but if he does, it could be one of the biggest bait and switches in recent memory. I'll admit, I'll miss the boasts, but I'm more than ready to get a more complete picture of Rocky as a human being, even if that means giving them up. Here's to the bait and switch. Not gonna say too much here. When something is this good, when a rapper and a producer are this in sync with one anther creatively, analyzing the result doesn't really serve much of a purpose. Just sit back, close your eyes, and let it wash over you. You'll be happy you did. Remember being in high school? Remember how important everything felt. Things that, as an adult, seem tiny — a breakup, some big test — but at the time were the most dramatic things you'd ever felt. The type of thing that made your heart pound like you had been standing on the edge of a cliff. Well, this song somehow captures that. I still haven't totally figured out why, but there's something about it that captures that feeling perfectly. Maybe it's that immediacy, that feeling that whatever it is Asobi Seksu is doing is the most important thing in the world, I haven't quite put my finger on it yet, and I'm not even sure if it is intentional (the lyrics certainly don't seem to suggest it is). But without fail, listening to "Nefi + Girly" always makes me feel like I'm a teenager again, living my life on the edge of a constant nonexistent cliff. I was legitimately surprised when Steven Ellison revealed himself to be Captain Murphy. As if the music he's been releasing as Flying Lotus wasn't impressive enough, he decided to release one of the most consistently solid mixtapes of 2012. And with this closer, he solidified his skills to anyone who may have doubted him. Where else are you going to hear lines like "Ain't never rock no mic, I only Rachmaninoff." "Yeezus" era Kanye maybe, but I doubt even he would name drop that obscure of a composer. The song keeps with the disturbing mix of sexual and religious (fitting with Captain Murphy's cult-leader characterization) that dominates the album, all of which is surprisingly realized given that this amounts a side project for Ellison. But listening to the skill and consistent quality of the rhymes and beats form "Du∆lity," it's no surprise that Kendrick recorded lyrics over most of the beats Ellison had previously set aside for the next Captain Murphy release. When something is done this well — even if it isn't for your main project — people stand up and take notice.